A list of 34 famous names of historical figures and culture icons with ESFP personalities. ESFP’s hold a unique place among all other personality types. They tends to prefer being on hands weather it be performing construction and maintenance or doing outdoor work where their artisan traits can be used to manipulate things. However, studies performed on ESFP’s also show the lowest job satisfaction rate among all types and most likely to quit their jobs within the next year. Only the people they work with tend to reflect any form of satisfaction rate that may be present. This aligns with their lack of desire to climb the corporate later as their values aim towards family. Interesting enough, ESFP’s are the most stressed out among all other types. Rather it be stress about children, finances, health, relationships, or education; the list goes on. This is commonly coped with by avoiding stressful situations or watching mindless television and sleeping. A special thanks to CelebrityTypes.com for listing out some great famous ESFPs. 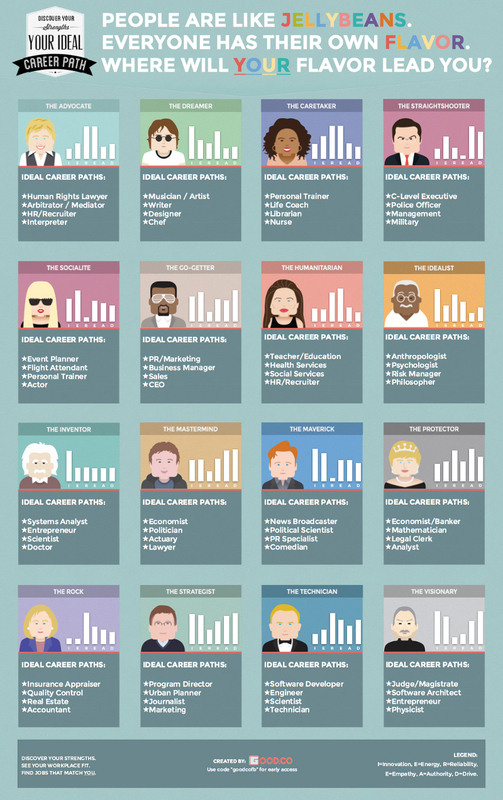 The below infographic outlines common careers that are best suited for the below common traits. This will help guide along professions that will best accentuate your natural behaviors.